I want an even 24 blocks for my Spiderweb quilt (I'm Queen Bee for July) so I just finished my 2nd block. The entire time I was sewing this, I kept singing the chorus for that No Doubt song "Spiderwebs" over and over in my head (and I'm sure I unconsciously started singing it aloud a few times). Hopefully I can find a way to shove it out of my brain before bed. Otherwise I'll be sleeplessly staring at the ceiling for a few hours. We have several international members in our Bee, so I mailed off all my fabric this morning to make sure it arrived by July 1. I've said it before, but I CANNOT WAIT until everyone gets their fabric and starts plugging along on my blocks! I was really nervous about going first in our Bee, but now I'm really glad because patience is not one of my virtues, and I would have been chomping at the bit for my turn! And of course, here are some photos of my wee lil' Japanese fabric Spidey block. ooooh, soooo pretty! Can't wait to get started! Come on Mr Postman! 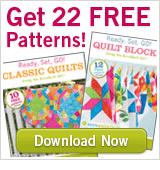 I'm so glad I'm not the only one who gets "quilting related" songs stuck in their head! lol.